The Navori Server and Manager combination provides users with a highly effective system for the management of your digital signage system through an advanced user interface designed for ease of use and support. The Navori QL Server module is installed on a Windows Server or for smaller systems a regular Windows PC is suitable. It operates as a background service and stores all its information in a local database. The Navori QL Server can scale from a single player to hundreds, or even thousands of players. 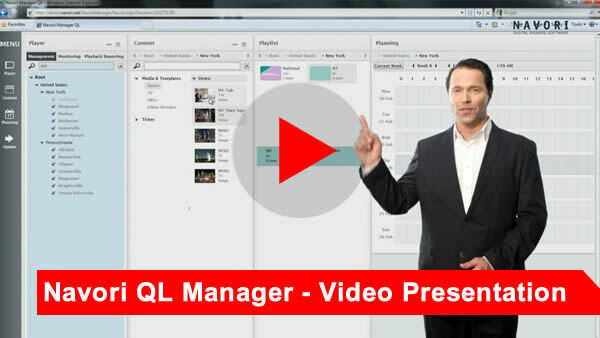 The Navori QL Manager is the management interface. It has a user-interface that is both easy to learn and simple to use. Users can access Navori QL Manager from any Windows, Apple or Linux PC via a web browser. The Navori QL Server software can handle anything from one to hundreds of Navori QL Managers that all work simultaneously, each according to a predefined set of User rights and permissions. Navori is suitable for Enterprise installations. A robust, expandable system with full features and reliability required for Enterprise Level installation. A Navori system can managed a single site or hundreds of sites locally or worldwide. As a system suitable for Enterprice Level digital signage installations, Navori is the one to choose. For a quick Navori Manager Overview - Select here. Players are managed in Groups and Sub-Groups. Define and organise libraries according to your needs. Media files (any supported format), templates and multi-zone containers (content created in the Navori Designer module). Banners and titling: Titling layer created in Navori Designer. This layer can contain geometric objects, images, date/time and real time data. Users can create their own playlists then drop them right into the programming grid. Programme updates are sent to Players based on their physical location, demographics, language, profile and more. Player monitoring provides full control of your Players providing feedback on their status and what is currently playing on what screen. Alerts and events keep you informed via SMS or email (more than 30 parameters are monitored). The monitoring window lets you know the status of each new program download in real-time. Navori Players upload their proof of actual playback reports to Navori Server. This information is stored in Navori Server's own database. The reporting system is quite powerful and very simple to use. From Navori Server, the top level administrator can create first level administrator accounts. These accounts can be granted access to a common group of Players or they can each be assigned an individual Player to manage. Each first level administrator account can in turn manage multiple users (Managers) and assign them up to 80 administrative rights. First level administrators can also create and manage their own sub-administrator accounts (for example, if they are hosting providers and wish to manage their own customers). There are no limits to the number of accounts that can be created and managed in this way. For each Manager account you create, you can define a whole series of rights such as which Player and which media libraries the user can access, what he can modify, if he is authorised to publish content to his pre-assigned screens or if he requires prior approval. With this application you can create content and aggregate data feeds without having to resort to a programming language. Navori Designer is accessible from any computer without the need to install a local software application. Multiple users can now collaborate on the same project. The installation of Navori takes very little time. Even on an Enterprise system, Navori can be operational within minutes. The Navori interface is easy to use. General users can access and learn the system very quickly allow a user to become productive soon after implementation of the system. The Silverlight interface works in all main-stream browsers today. Users can access the system from any location to make changes and updates to their system. No dedicated application is required on the desktop allowing SOEs to be used with ease. The system can be purchased in modules - "A La Carte" style - you only purchase what you need. Combined with the ultra-efficient player which runs on low-cost hardware, the capital expenditure for a Navori digital signage systems has great advantages over the competition. The new Navori QL system has driven down the cost of operations. The operating expenses are up to 80% less than the competition. Microsoft Silverlight plug-in must be installed and functional on the management computer.